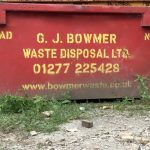 If you’re looking to dispose of smaller quantities of asbestos waste, G J Bowmer (Waste Disposal) LTD can recommend a tailor made service, to suit your requirements. Whether it’s our unrivaled nationwide, 24 hours a day, 7 days a week van collection service; or our fully licensed asbestos transfer station. 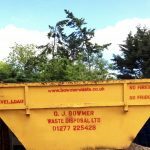 We deliver a personal yet professional approach and with over 35 years experience in the disposal of asbestos we provide unparalleled understanding and advice towards, and in the disposal of your hazardous waste. Please call us for prices on the disposal of asbestos waste brought into our transfer station. The price can be calculated either on an item rate or tonnage rate depending on the quantity you have, to ensure your getting the best rate possible. Please note all asbestos waste must be suitably prepared by wrapping any asbestos sheets in high grade polythene and secured with duct tape. Bagged asbestos waste must be suitably bagged and securely fastened with duct tape. No holes or tears to the packaging, to ensure the asbestos is securely sealed. 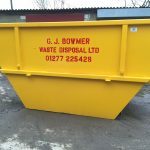 Appropriate PPE must also be worn at all time whilst the unloading of waste in the transfer station.